Built in the 16th century and maintained in immaculate condition, Thornbury Castle Hotel now acts as an inspiring setting for meetings and conferences, private dinners, summer fun days with team building, and exclusive-use events. Built by Edward Stafford, Duke of Buckingham, during the reign of Henry VIII, Thornbury Castle has a history that’s almost palpable as you walk its centuries-old halls. Henry VIII honeymooned here with his wife Anne Boleyn, after executing Stafford for treason and seizing the castle. Today, the castle offers a unique experience as a hotel, restaurant and event venue, where guests can find inspiration in a piece of the country’s history. Within the castle, there are 27 sumptuous bedchambers, most with four poster or coronet beds and some with feature bathrooms. You will also find chandeliers, wood-panelled walls and furnishings that combine medieval style and modern comfort. “The Duke’s Bedchamber” which was where the King and Queen spent their honeymoon, is still available as a guest bedchamber to this day. 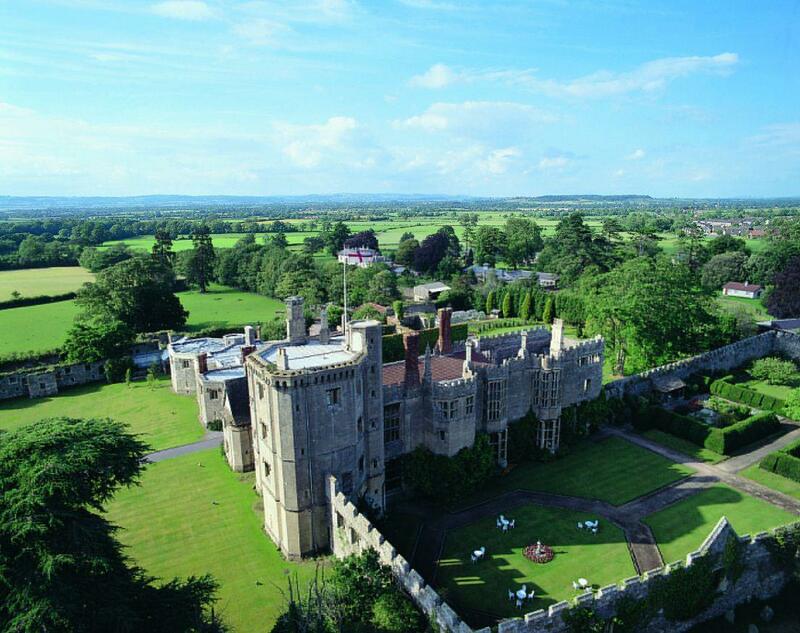 Thornbury Castle offers contemporary comforts and conveniences of a modern venue, with breath-taking historical grandeur. Surrounded by landscaped gardens and enclosed by crenelated walls, the castle inspires delegates as they approach. The conference and function rooms within are equally impressive, with stone walls lined with suits of armour, lending a sense of weight and majesty to any event. There’s Wi-Fi throughout the castle, and your room will be ready to use an hour before your event, giving you time to set up. The castle also has an award-winning restaurant and offers wonderful food and drink that live up to the venue. Our Head Chef, Andrew Chan and his team of talented chefs prepare fresh food with an emphasis on choice and quality using seasonal ingredients, many of which are grown in our castle gardens. With an emphasis on choice and quality, they can tailor a menu to match your event and to meet the requirements of attendees. This tailored service is a key part of Thornbury Castle. Each event is managed by an events specialist, who can help you to plan your meeting, conference, away day or private dinner. They’ll be there on the day to ensure things run smoothly, leading a team of efficient, professional service staff. There are plenty of options for memorable business events, from day-long workshops to large-scale conferences with exclusive use of the castle. You’ll find Thornbury Castle Hotel on the edge of the Cotswolds, just north of Bristol and Bath and conveniently close to the M5 and M4 Motorways. The castle is also easily accessible from London Paddington Station with direct trains every 30 minutes and a journey time of just 80 minutes to Bristol Parkway station, which is located just 9 miles away. There’s complimentary car parking on-site, and even a helipad, though remember to call ahead if you want to arrange a landing. This 16th-century castle truly is a unique venue, with delicious food, excellent service and fantastic facilities, perfect for infusing your event with a little regal grandeur. The Tudor Hall is a magnificent, stone-walled room with a huge open fireplace, suits of armour and walls adorned with medieval weaponry, paintings and tapestry. The room can be lit by candelabra, although there's plenty of natural daylight through the multi-paned high window. The Barons Sitting Room is situated on the first floor, overlooking the vineyard and courtyard. It has wooden panelling.